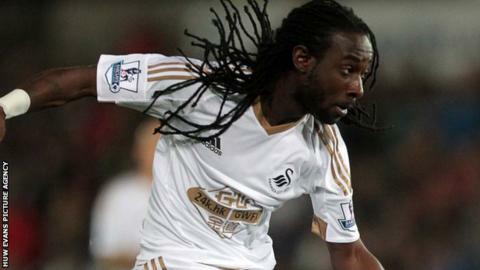 Swansea City manager Garry Monk has confirmed a proposed loan move of striker Marvin Emnes to Championship side Bolton has fallen through. Emnes, 27, has not featured for Swansea in the Premier League this season and has been limited to one substitute's appearance in the Capital One Cup. The Dutch forward's proposed move collapsed prior to the Swans' 1-0 League Cup defeat at Hull City. "I only got told as I was walking into the ground," Monk said. "I have to speak to the relevant people to understand what's gone on there." Monk made 10 changes for the League Cup fourth round tie at Championship side Hull City, which was settled by David Meyler's close-range finish. Eder and Wayne Routledge missed chances for the Swans and Monk blamed wasteful finishing for their defeat. "It's definitely wasteful finishing," Monk said. "There were no defenders about when we were taking those chances and we should have scored three, four or five goals in that first half. "We showed a lack of composure which was disappointing because we were so far in control of that game. "We were playing some excellent football and really creating those opportunities, carving them open and we couldn't manage to get that goal."